I have long been something of a homemade pizza snob: dough and sauce from scratch. 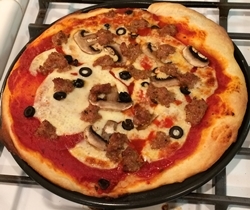 But my success this summer with pizza on the grill using Trader Joe’s pizza dough and Cento canned sauce (along with my lessons learned) made me want to bring that experience indoors after the grilling season. It has been a learning experience. In my first attempt I quickly discovered that while my own pizza dough worked fine on a pizza pan sprayed with olive oil, Trader Joes’s does not. It sticks. Attempt number two was with TJ’s whole wheat pizza dough. The lesson there is: don’t use it. The consistency is entirely different and it just doesn’t work properly. On attempt number three, back with the regular Trader Joe’s dough, while I hate to go heavy handed with Crisco, it does keep the crust from sticking to the pan. My problem was going overboard with the sauce and toppings. So, fourth time’s the charm? I guess so. Heavy on the Crisco coating the pan, but spraying that with olive oil to assuage my guilt. About four-fifths of the can of pizza sauce. Take it easy on the toppings. Five slices of Provolone. Fifteen minutes at 450 on the bottom rack, perhaps a bit too long and/or a bit too hot. But overall it came out pretty good. 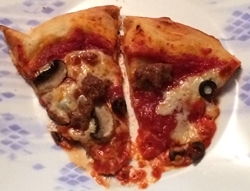 I learned to take extra care slicing the pizza, as it’s hard to break through the baked TJ crust. A vegetable knife at the edges helped to create discrete slices. I certainly have plenty of room to fine tune and improve, but my definition of success with homemade pizza is when I can pick up and eat a slice by hand without having to use a fork. By that definition attempt number four was a success.